The most important aspect of our practice is a willingness to see what is without resistance. This is the yogic principle of Santosha – acceptance and contentment with what is, without inferring non-action. We don’t have to like it. Neither do we have to not like it. We simply need to make a commitment to witnessing anything that arises within us without judgement. This is a very powerful technique. When we cease resisting noticing anything about ourselves, the very issues that our resistance is attempting to keep out of our awareness simply dissolve. They dissolve because we witness them without resistance. So simple. They dissolve because the field of awareness from which we are witnessing them is simply more powerful. The most powerful force in the universe is the evolutionary movement toward Unity. We see what we are able to accommodate based on the level of comfort that is increasingly present as we travel into the deepest levels of awareness – of which we are made. The movement is always toward more inner comfort. Eventually we begin to trust this movement fully. We trust it because we experience the increasing satisfaction and sense of being at home that contacting these deep levels offers, not because it is a philosophical idea that we like. In asana practice, in movement and in stillness, we always begin from what we call whole-body-mind-support-templates. These are matrices of integration that include the whole body-mind-awareness system. They are interrelating and interpenetrating layers of support. It is important in our asana practice not to continue the fragmentary ways of self perception that we habitually use in life. By taking this approach, whole-body-mind-supports, we are already moving toward a more holistic self experience. The Yogic system of whole-body-mind-integration is pointed to in Tantric philosophy. It is the system of the kosas. Kosas are spiralic and interwoven sheaths of awareness and manifestation – from the most subtle to the most obvious – that woven together, complete the whole cloth of our individual personhood. The kosas also relate to the elements, from the most subtle to the densest: space, air, fire, water, and earth. Each of these elements is part of the stuff that awareness mixes with to form individual qualities, traits, and characteristics. Awareness and all elements are contained within every cell. Therefore each element serves as another whole-body-mind-supporting template. Please keep in mind: We use our senses to experience this. Senses are a very important aspect of this elegant perceiving system that we are. Each of our senses has the outer more obvious representation of itself and an inner subtle sense. We touch with our hands. We also touch internally cell to cell, tissue to tissue. Our inner touch can be further refined to feel the varying qualities of inner sensation. Remember, everything is more pleasurable the deeper we go. The senses are attracted to the inner body-mind and the subtle and yet powerful sensations of comfort, peace, and home. The first, the most subtle, or the deepest whole-body-mind-support-template is Awareness. Awareness is experienced in the body as well as the mind. It is a completely unified field and is the first template of individuality as well. Awareness perceives itself, without thought, simply as pure perception. This seems difficult to understand because “understanding” involves an object of perception and a perceiver. At the level of pure being there need be no object in order for perception to be happening. Perceiving is always happening whether there is an object or not. The field itself, perceives itself. Please remember this is not a philosophical principle to understand. This is experience experiencing. It is not something that you need to make happen. It is happening. All you and your personal self identifying structures need to do is to witness yourself from the perspective of the vastness. Remember? It’s just like turning a switch. When the light is off you cannot see where you are. When the light is switched on you can see yourself in the perspective of the room. The room was there all along. You just couldn’t see it. Nothing has actually changed except for your ability to perceive. This is the interface point where the Vastness is beginning to move into form. As Universal Awareness moves into the individual body-mind system, its first and most subtle expression is bliss. The coming together of Vastness and individuality is experienced as waves of bliss. This bliss is not the same as happiness that is dependent upon circumstance. In fact, happiness would not be a good way to describe the yogic experience of bliss. Yogic bliss is a deeply settled inner recognition of Unity manifesting into form. It is a sense of wholeness and inseparability from all of life that gives rise to love and compassion. Most simply put, from the individual perspective, this is profound and complete comfort on every level. No matter what the situation or the circumstances of an individual life may be, this level is always present. It is called Ananda. Its existence is not dependent upon feeling good. It isn’t lessened or increased by sorrow or pain. It is just always there. It also doesn’t deny sorrow or pain. If we inquire deeply enough, even in times of suffering, we will see that ananda is present. At the cellular level, the cell recognizes itself to be awake and alive and immediately recognizes the entire family of cells to be the same. The element here is space. It is experienced in the body-mind as a spacious expansion of comfort and relaxation, the feeling of being at home in universal awareness and within ones own skin. This experience of bliss is entirely natural and normal. You have very likely experienced this many times and at some level of your awareness you recognize it already. The only reason you perhaps haven’t noticed it is that you are usually preoccupied with something else. It is just right there! Right underneath and supportive of whatever else is going on. Best witnessed in savasana, perhaps, ananda is associated with the sense of hearing. It is at this level within, that we hear the primordial sound of Pure Awareness moving into form. Again, we hear this. The yogis call this sound Nada. The Nada is expressing from the interface point where Pure Awareness is moving into form. Ananda is a whole-body-mind-support-template. Every cell witnesses this. As Awareness continues its movement into form, the highest level of mind becomes apparent. Again, realize this is not something happening within the brain. Wisdom and discrimination are equally everywhere. They fully penetrate the entire body-mind system that is now taking form. This is the quality of Knowingness. Knowingness is not a thought, it is an immediate recognition. The element is air. Air is expandable and compressible. It is dense compared to space and yet it has a quality of lightness and mobility. The compressibility and rebound of air brings in the sense of touch. The inner touch, cell to cell, tissue to tissue, a bonding to self and family within the body. This is the level at which love begins to be felt in the cells: community within and community with others, lover, family, friends, and the larger community of the environment and the world. This is a unifying support template for the whole-body-mind also as it is felt everywhere simultaneously. Seated, soften your hand and then rest it on your thigh in full contact. Touch. Is your hand touching your thigh, or is your thigh touching your hand? What does this touch feel like? Where does the sensation begin and end? How far does it spread? Touch somewhere else with your soft hand. Find a comfortable position where your belly can touch your thighs. Move your belly toward your thighs and your thighs toward your belly. Feel the touch. Might there be love in this? Fire is the power of personal transformation. It is our Tapas, our burning desire toward personal evolution. Within our bodies, the fire element includes the processes that use heat and combustion: energy synthesis, digestion, all aspects of metabolism, and many neuroendocrine functions as well. This is also the thinking mind. Thinking and nervous system functions have a dry, light, quick, and hot, quality of fire. We sense this bright light quality of metabolism in the cells. The Greek root of metabolism means “to change”. Metabolism transforms particles within the body to make useable nutrients and to break down complex substances into waste products that can be excreted. At the level of consciousness we have the same opportunity: to break down complex substances into useable particles and/or waste products that can be excreted. Our inner metabolism, how we are able to digest and assimilate life as it is, propels our personal transformation. The sense that relates to fire is sight. There is a quality of clear definition and differentiation in our sight. We see the lines, and shapes, and depth. In our bodies this relates to the sensing of our nervous system. Sensing is dry, light, and quick. We see within. Feel the brightness and the clarity of your perception of the light. Feel your inner heat. Even if you feel cold, you have inner heat. Where is it? Can you feel it in the cells? What are your cells “doing”? There is a brightness to it. See it within. Stand in Tadasana. Feel the element of fire, perhaps in your belly. How does fire move? Reach up to begin a sun salutation from the tapas, the fire. Feeling is a fluid experience and takes place within the water element. Since our structural body may be as much as 70% water, there is a lot to feel here. We have blood, lymph, organs, skin, fat, and many other bodily fluids. Each has their own expression with particular qualities and traits of consciousness and form. There is a lot of emotion at the water level. We feel rushing, surging, seeping, pulsing, and wavelike movements that express the many textured levels of feeling. When we were very young and just developing in utero our body structures were developing first through the prana flowing through fluids. The direction of the pranic movement is underneath all of our physical structures. This is both a memory and an ongoing flow that supports the continuation of health throughout our lives. When these flows are interrupted or blocked due to rigid thinking and hardened movement patterns health is compromised. We are less comfortable in body and mind. Tapping into the underlying movement of prana within our fluid bodies we once again allow it to flow undisturbed. An unimpeded flow of life force is a great boon to our health and clarity of mind. Full and free pranic movement limits our susceptibility to disease and helps us to develop to our full potential. The natural result is a more fulfilling life that feels useful and valuable to others. Our organs are primarily fluid in their makeup. Each one expresses specific qualities of intelligence and awareness. Together they form a symphony of support and function. Water is mobile and flows downward with gravity. Water molecules attract one another. They hold together; they bond. Can you taste within? Can you savor every moment and experience of the inner world? Feel now the quality of whole body experience that results from imagining the taste of something delightful. Don’t you feel that everywhere? Stand in Tadasana. Feel the flow of your blood from your heart, to the peripheral body and its seeping back again to the heart. Feel the fluid sensation in your legs and your arms. Begin to let your body move as if the inner fluid flow was directing the movement. Water moves in many spiralic ways through your body tissues. Experiment. Close your eyes and follow the fluid flow within. Allow your bodies outer movement to express the varying inner flows. Savor the movement. Earth is stable. Earth moves slowly. Earth without water is dry, particulate matter. It is our mineral body – our densest form. The particulate forms the scaffolding upon which all other elements can attach. It is the mineral content of the bone. It is the particulate and structural that is distributed throughout the body, within the cells, within the blood, and everywhere else. Our earth. Smell is the first sense to develop. As tiny babies we use it to find our mothers breast and the milk. Earth within is about being here, survival, existence in the most basic way. It is deeply, quiet, heavy, and present. It is clear and simple. We continue to feel the earth within as the basic structural materials. Stand in tadasana. Feel the weight transfer through your bones and into the earth. Feel the steadiness, the stillness of taking all of your awareness into exploring the qualities of your mineral body. Movement is a quality of life. One celled organisms move. Everything that is alive moves. Life itself expresses from Source through movement. We are in constant movement within. We perceive inner movement with our inner senses. Different qualities of movement spark different perceptions. Different perceptions express in different qualities of movement. Perception, movement, and senses are intimately woven together. They’re woven in the cloth of Awareness. Movement at each of these levels, these sheaths of awareness, has a different quality. We contain all these elements, they are moving in relationship to one another, they are perceiving themselves, and we are perceiving them. By going to the consciousness of each layer, we bring up, we enliven, its qualities in every cell. The whole body becomes unified in the sensation of an individual sheath and its expressive element. This expresses uniquely in each person based on the personal body-mind system. When this is fully recognized by the individual it can become an ecstatic celebration of life. We have witnessed this in dance perhaps, and in the extraordinary coordination and abilities of elite athletes. What do you perceive through your senses? As yoga practitioners we have refined our senses somewhat already. We have “sensitized” ourselves. Feel outward with each sense, into the environment. Then turn it inward. The inner touch, scent, taste, sound, and sight. Do the inner perceptions of the moment inspire any movement? Can you further integrate the outer senses with the inner? What do you notice? After you have explored each of these elements individually let’s put it all together and notice the seamless transitions from one to the other. Earth: We can recognize earth as heavy, clear and simple. Moving from earth is slow. If you raise your arms in tadasana from the earth element there will be a dryness to it. As the arms go upward the weight is falling directly downward into gravity. Particulate, sifting through its liquid environment. Water: Now try the same thing from the sensation of the fluid body. You may feel the surge of the water earthward and the fountain like effect of the upward reaching arms. Do you notice in both of these examples how the whole body seems to pick up the qualities of the awareness from which you are initiating the movement. Try going further with the sun salutation or some standing postures. The differences in the tone is remarkable. Try fire: Again stand in tadasana. Let the fire begin to burn in our belly. How does this alter your awareness? Begin to move. What is the quality of movement here? Air: Is there almost a sigh of relief in coming into the air element. Feel the arms float upward from the expansion of the air within the chest and the heart. Air is both expansive and compressible. What is the consciousness that arises with air? It is light now. There is a delicacy to the movement of air. It doesn’t surge. It doesn’t burn and it’s certainly not heavy like earth. There is a gentleness to air. Feel the air. Sense it. Move from it. Love is embedded here. Can you feel that? Space: By moving from air to space we have an idea of how light and expansive space is. We can see and feel air. Space is where the air is. Feel the subtle expansion in the slight pause at the end of a soft exhale. There is a pulse outward there. Space is found in the effortless suspension of the breath. In tadasana again: How far do you move from space? Perhaps this is move an inner expansion than an outward movement. As you catch the inner expansion, how does your body move? What is the consciousness that is expressing here? Penetrating Awareness: Something even lighter than space? Not perceptible through the outwardly directed senses, but Known by the inner senses. When we prescribe a particular method of movement into, and within, our yoga postures we limit the individual expression of each person and their inherent qualities and traits. If we direct our yoga students to enter a particular posture in the same way every time we actually constrain the full expression of the form. Different yoga systems tend to have an affinity for different elements and levels of awareness. 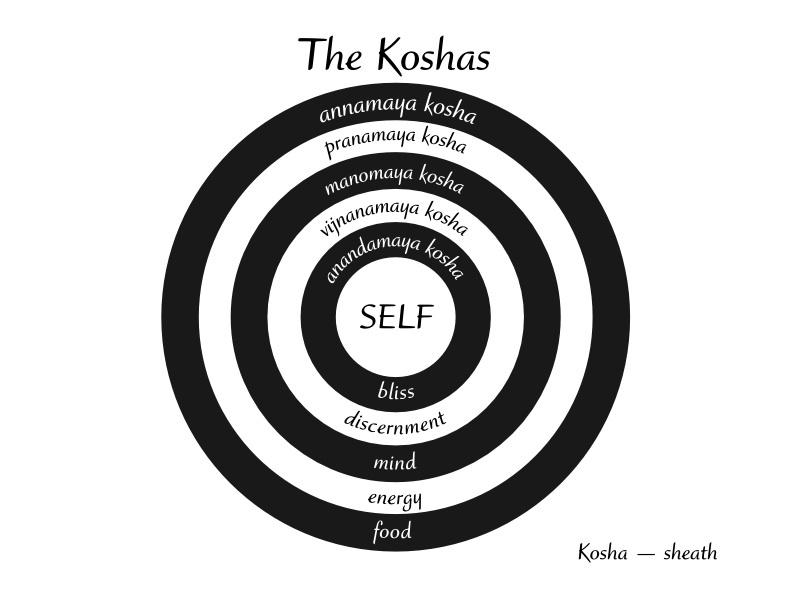 By knowing the framework of the kosas, the consciousness, and the elements of each kosa, we have a larger container from which to assist our students to feel the awareness within each form. Thank you for this article…I love your insights so much. Thank you so much for reading, Peach.